Arrive at Kushok Bakula airport Leh situated at 3500m altitude, met by our representative at the airport and transfer to your hotel in Leh city 3 to 4 km. On arrival at the hotel welcome drink and then proceed to your rooms and take full-day at rest to acclimatize yourself completely to the high altitudes of Ladakh which is must. 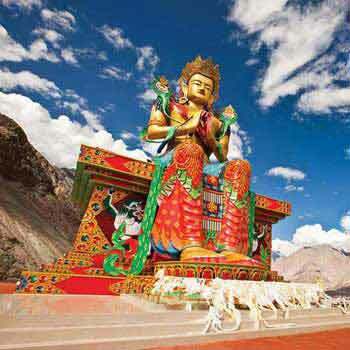 Evening around 4:30 pm visit Shanti stupa which offers the best aerial views of Leh town and then visit Leh bazaar. 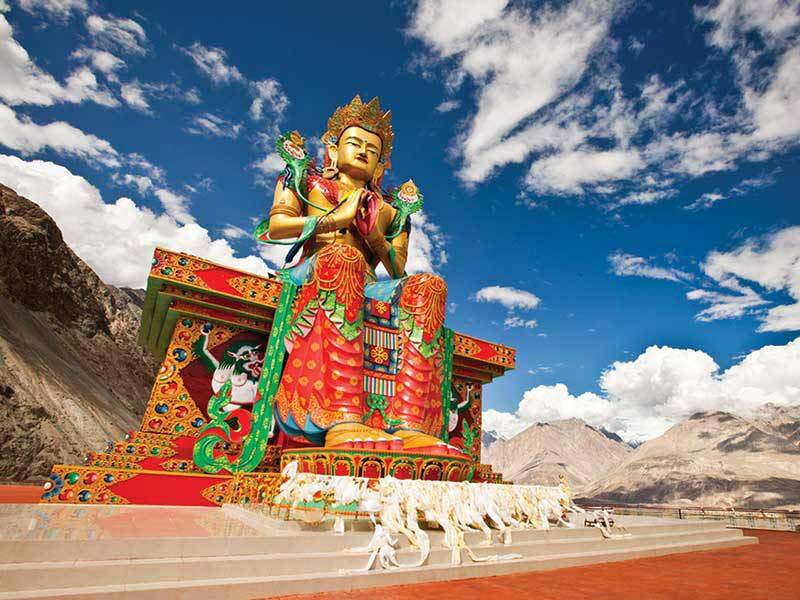 After breakfast excursion to visit the 1000 year old paintings of Alchi Monastery 68 km from Leh en-route visit the great statue of Maitreya Buddha at Likir monastery, Sangam of Indus & Zanskar rivers which are the two major rivers in Ladakh, Magnetic Hill and military Hall of Fame. Overnight at the Deluxe Camp / Hotel. Morning drive to Nubra Valley 125km crossing Khardongla Pass 18360 ft, the world highest motorable pass. 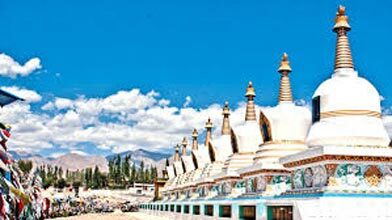 Afternoon visit Diskit & Hunder Monasteries and the white sand dunes with perhaps a Camel Safari on the double humped camles which are found only in Nubra as far as India is concerned. Morning visit Samstanling Monastery and then drive back to Leh via Khardongla pass. Evening free in Leh bazaars for last minute shooping, in Leh items like pure Pashmina shawls, good pearls, Chinese cutleries and beautiful Ladakhi wooden handicrafts can be purchased. Early morning fullday excursion to Pangong Lake 135 km / 4400m east of Leh crossing Changla Pass 17500ft and driving via Durbuk and Tangtse villages in the Changthang region of Ladakh and perhaps one of the most amazing lakes in Asia which changes its color 4 - 5 times a day. Evening free in the market. Morning transfer to KBR airport to board flight for Delhi.